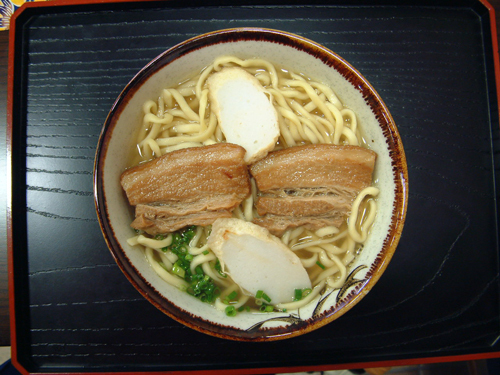 Okinawa Soba-Originally brought from China over 500 years ago and was only eaten by the royalties until the Okinawa Annexation prohibition (during the Japan’s Meiji Period) was lifted. The noodles are flat and widely thick close to udon noodles. Usually topped with pork belly, scallions, fish cake, and gingered pickles. The soup is a broth made from seaweed, bonitos, and pork. For extra spice chili pepper is the best match.